We at Roatan Ocean Adventures (ROA) are equipped with everything you need to catch the big one! If fishing is what you want to do while you’re in Roatan – then you have found the perfect place to give you the best trip ever!! 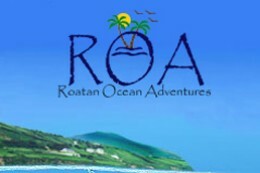 We have lived and fished Roatan for our entire lives and we know where the sweet spots are!! We have nice boats with all of the equipment you will need to catch the fish. Our guides set you up and get you fishing while helping when you land that huge fish as well as cleaning and getting your fish ready to eat! We also abide by IGFA Good Sportsman’s Practices and release ALL Bill Fish. We have deep respect for our beautiful coral reef and its delicate eco system. We assure that we leave the sea as good, or better, than we found it. So what do you want to catch? Marlin, Sail Fish, Wahoo, Mahi Mahi, Tuna, Snapper or…??? Come ready to hook ‘em up and fight to the finish! Check our pictures to see some of our past successes. This could be you! While you’re with us on your fishing charter, we are taking care of the picture-taking too! This nice little bonus is included FREE with the charter. We then email the photos to you so you will have your memories for a life time. We also include refreshments and snacks at no additional charge. Oh – and when you enjoy our fishing charter, you get a side trip to the Iguana Farm – FREE! We love to show what our experts are doing on land to preserve the endangered species of iguana here on Roatan. We are proud of our island, both land and sea, and want to preserve our natural resources for future generations. Fishing Charter: ½ day = $300. Full day = $500. Or you can contact one of us for hourly rates too.